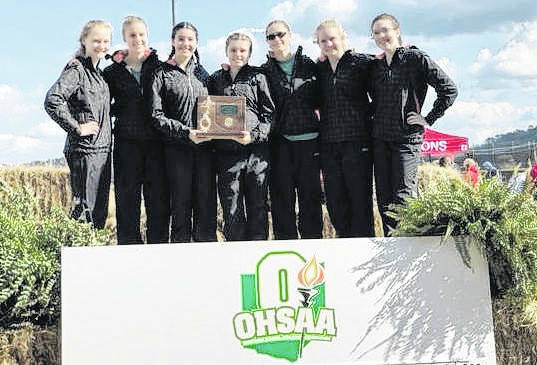 RIO GRANDE, Ohio — Local runners race into regionals. The Eastern, Southern and South Gallia cross country teams competed at 2018 Division III OHSAA Southeast District Cross Country meet held Saturday on the campus of the University of Rio Grande in Gallia County. In the boys event, the top six teams and those individuals that finish in the top 24 advance to the regional tournament at Pickerington, Ohio. In contrast, the top seven teams and those individuals that finish in the top 28 advance to the regional tournament in the girls event. A total of 36 teams and 296 varsity participants competed in the event, with Leesburg Fairfield coming away with the boys team title and Peebles capturing top team honors in the girls event. Both varsity races featured over 100 runners apiece, with 137 boys and 159 girls taking to the course in the separate competitions. In the girls event, Peebles posted the winning score of 78, while Eastern captured second place with 105 points. Rock Hill (114) followed in third place, while Zane Trace (138) and Winchester-Eastern (144) rounded out the top-five team finishers. West Union (185) and Dawson-Bryant (198) closed out the top-seven qualifiers in the girls race. For the Lady Eagles, Rhiannon Morris set the pace with a third place effort of 21:04.37 and was the first of two top-24 finishes for EHS. Ally Durst (22:33.17) was next with an 17th place finish, while Whitney Durst (23:43.48), Lexa Hayes (24:30.83) and Ashton Guthrie (24:33.69) posted 30th, 41st and 43rd place efforts, respectively. .
Alysa Howard (26:23.06) and Megan Ross (27:57.65) rounded out the top-seven finishers for Eastern with 70th and 91st place efforts, respectively. Southern’s Sydney Roush qualified for regional competition, placing 12th with a mark of 22:02.91. Mallory Johnson (24:49.30) and Kathryn Matson (27:22.00) were next for the Lady Tornadoes, posting 48th and 84th place efforts, respectively. South Gallia was led by Jessica Luther who placed 66th with a mark of 25:54.61, while Cara Frazee (26:40.10) rounded out the Lady Rebels’ top-two finishes with a 77th place effort. Jenny Seas of Peebles won the girls race with a time of 19:38.28, with Hannah Kerr of Zane Trace coming in second with a mark of 20:57.29. Belpre’s Eli Fullerton won the boys race with a time of 16:58.57, while Evan Leist of Pike-Eastern was the runner-up with a time of 17:18.59. Leesburg Fairfield came away with the boys team title after posting a winning total of 33, while Trimble was second with 79 points. Belpre (99), Green (136), Whiteoak (141) and West Union (182) were next to round out the top-six team regional qualifiers. Eastern’s sole representative in the boys event was Colton Reynolds qualified for regional competition with an eighth overall effort with a mark of 18:08.22. South Gallia’s Garrett Frazee also posted a qualifying effort as he placed 24th with a time of 19:08.60. The 2018 Ohio High School Athletic Association Regional Cross Country meet takes place on Saturday on the campus of Pickerington High School North at 11 a.m.
Visit baumspage.com for complete results of the 2018 Division III OHSAA Southeast District Cross Country meet.